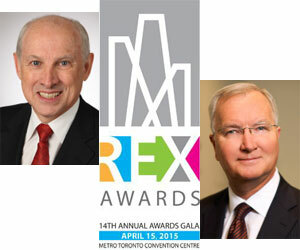 The Greater Toronto chapter of the Commercial Real Estate Development Association (NAIOP) will honour four individuals for their contributions to the industry at the 14th annual NAIOP Real Estate Excellence (REX) Awards on April 15 at the Metro Toronto Convention Centre. John O’Bryan will receive the Lifetime Achievement Award, Paul Morse a special Directors’ Award, and Tony Reale and Andrew Hoffman the Community Service Award. ☛ Reale is a managing director and head of property brokerage and real estate advisory at BMO Capital Markets. He’s responsible for the execution of national property brokerage mandates and buy-side advisory work. Reale has more than 23 years of commercial real estate experience, covering advisory, property brokerage, acquisition due diligence and investment banking. He previously ran the real estate national advisory practice at Cushman & Wakefield. ☛ Hoffman is founder and president of CentreCourt Developments, a real estate development company focused on developing high-rise condominiums in Toronto. During his 25-plus years in the development industry, he’s been involved in some of the city’s major residential, office, industrial and mixed-use projects. Hoffman was chief operating officer of Menkes Developments Ltd. before starting his own company. Reale and Hoffman contribute much personal time to a number of community organizations, including the Hold’em for Life Charity Challenge, which they co-founded in 2006. It has since raised more than $18 million for cancer research and other worthwhile charitable initiatives. The REX Awards will also recognize ”’Best of the Year” teams in seven categories and a developing leader (under-35) recipient along with the four honourees. The NAIOP Greater Toronto chapter represents developers, owners and related professionals in office, industrial, retail and mixed-use real estate while advancing responsible development and advocating for effective public policy.